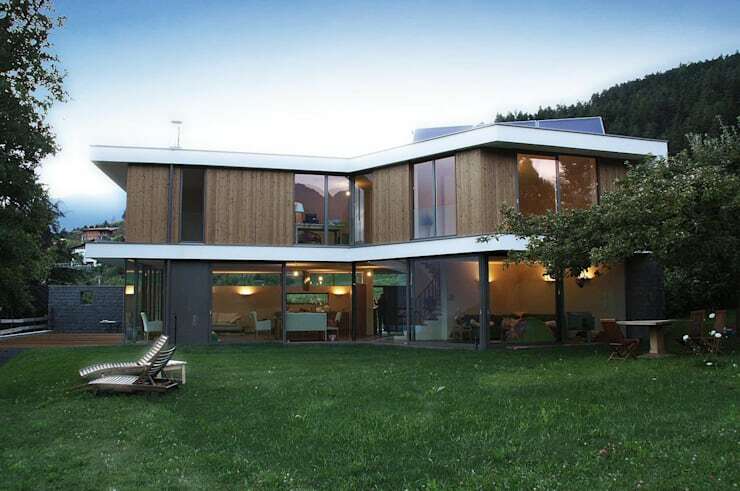 Unlike house designs that use the surrounding physical limitations of the site as their guiding design principle, this home from architects WSM Architekten uses the surrounding mountains of Italy’s picturesque South Tyrol as the base for its design. Focused on two major visual references, the rural home is oriented for optimal views of the Etschtal in the Southwest and of the builder’s favorite dolomite peak to the East. 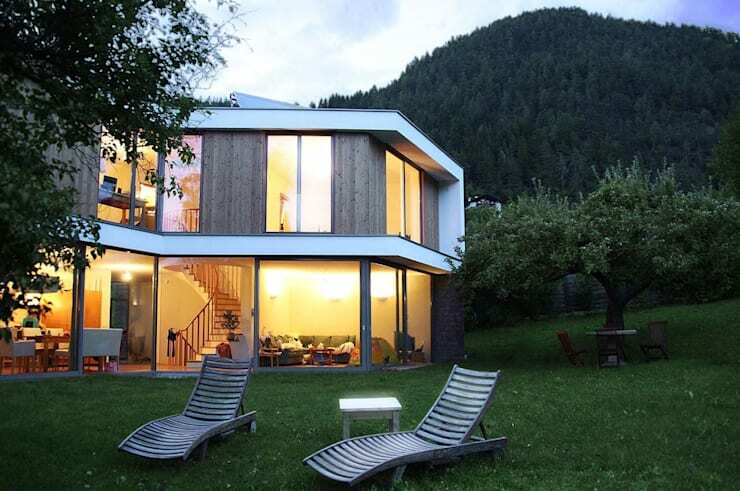 The serenity and carefree feeling of living in the small town of Brixen is emphasized in this home’s design, offering up a composition of spacious rooms, open design, natural materials, and seamless connection to the outdoors. 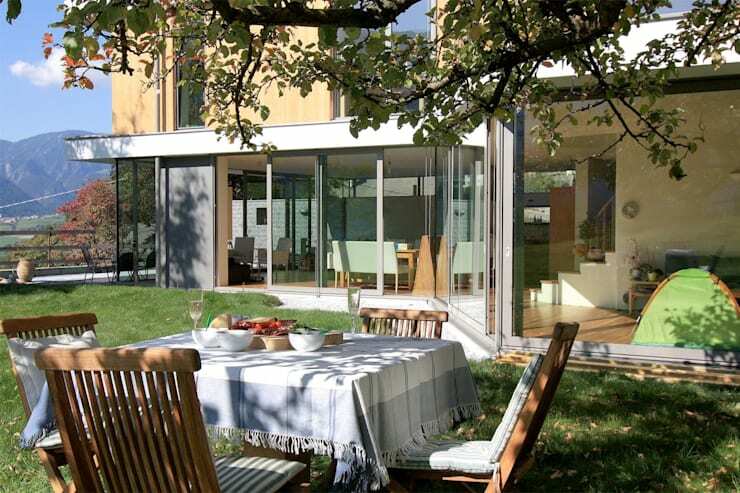 The home’s original and unconventional shape draws its definition from the natural landscape, with soft turns allowing the building to approach—but not interfere with—the surrounding trees. Sensitive to ecology and topography of the area, the house includes an underground garage that allows the home to sit comfortably within the scale of the site. The building materials include larch wood, white brickwork, and natural stone walls, and of course, plenty of crystal clear glass. The backyard view shows how the house is shielded from the slope, opening up to a backyard with more transparency. Recognizing the beauty of the location of the home, the backyard offers an ideal setting for a summer picnic under the shade of a leafy tree. 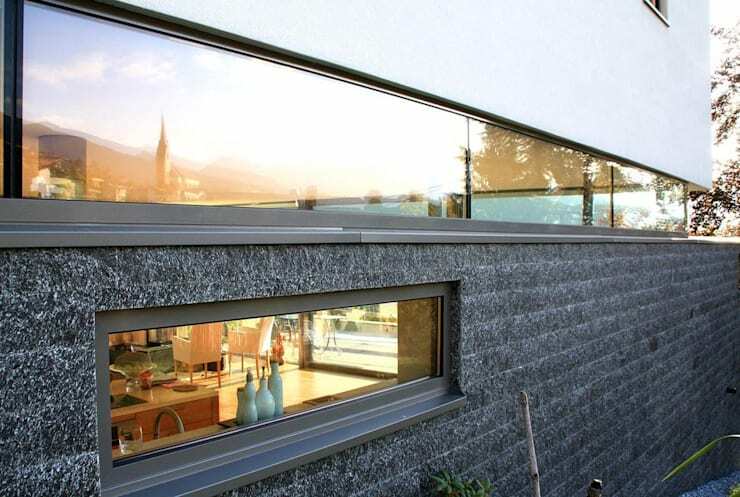 Two themes that are present throughout this project are the themes of transparency and connection, with windows like these providing an intimate link between the new home and its immediate surroundings, with charming views of the nearby town. The lower floor of the home includes the kitchen, dining room, and common living areas, many of them melded into one large room. 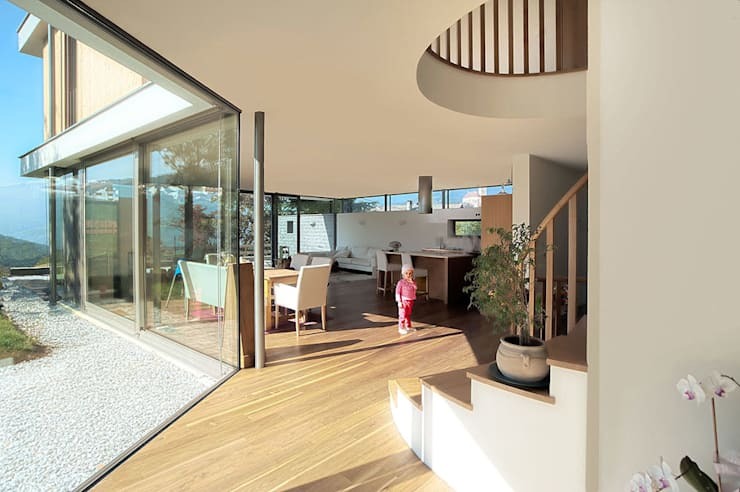 A central staircase serves as an anchor in this layout, forming a central shaft that provides an open, flowing connection at the heart of the home. 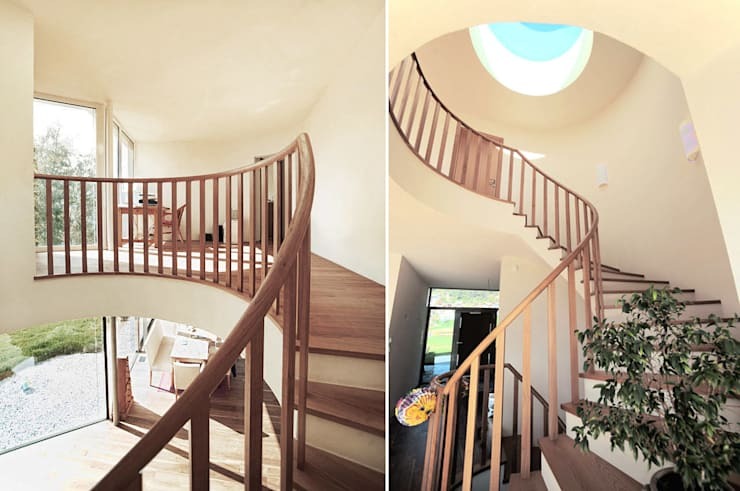 A closer look at the spiral staircase shows a complex and original design that allows for a seamless connection between various spaces of the home environment. As the wooden stairs wind up to the mezzanine and upper floor hall, the residents enjoy the abundance of natural light that flows in from the window overhead. Fluid and effortless, this design instills a sense of wellbeing as it spirals from floor to floor. This image illustrates the importance of nature in this home’s design, with transparent walls turning the outdoors into an ever-changing wall mural for the entire lower floor. 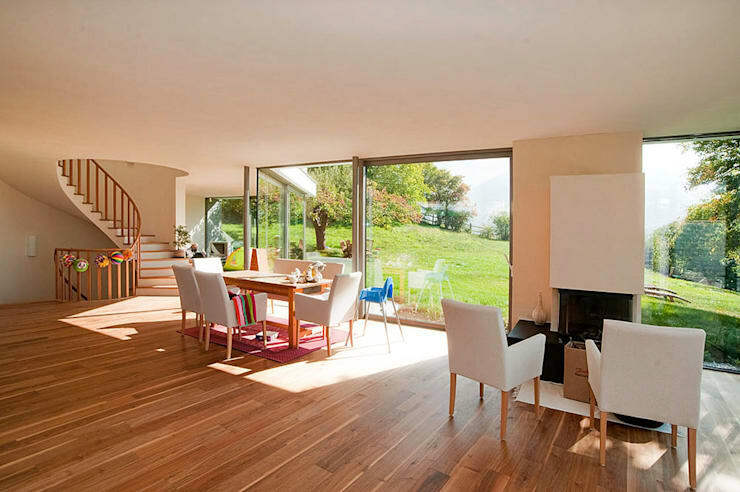 Wooden floors complement the eco-centric character of the space, with open space and soft sunshine acting as the core elements of the room. Share your comments on this natural home below!